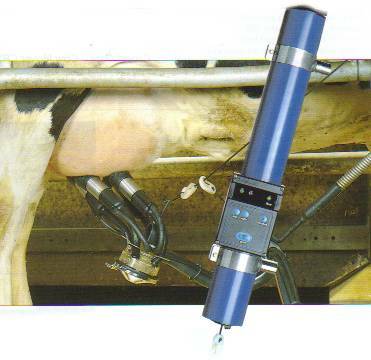 quality second user milking equipment. Payment by credit card now accepted for items shown here, or for purchases of new equipment and spares. Please note that due to the very high cost of shipping, this equipment is only available for sale within the UK. Set of 14 available, complete with acr rams, float chambers, control valves, mounting brackets, control boxes and transformer. This is the earlier type of box, without pulsation stop. All in excellent condition. [Please note that the acr rams are Fullwood, and not the normal ACR500 blue rams] For sale on behalf of a customer. Complete with standard shells if required. Complete with ACR5000 bridge kits if required. Recently serviced with new vanes, bearings and vee belts. Complete with pinch valve, amplifier, toggle switches and new tubing. All prices exclude VAT and Carriage. To the best of our knowledge, all equipment advertised is in good (or better) working order. Copyright dc engineering 1987-2011. All copyrights, trademarks, service marks, and logo's are the respective property of their holders. This site may not be copied without the written consent of dc engineering. All text that is intellectual property is copyrighted. Images and our Logos are copyrighted and may not be reproduced in any way without the written consent of dc engineering. This site is maintained by Shaun Wheeler. and was last updated 05/07/2017. dc engineering is listed in agsites.net. We record weather conditions and data on the Isle of Wight which can be viewed at Isleofwightweather.com and Isleofwightweather.co.uk. Milking machine spares and spare parts for milking machines can be found in our online shop here. Dairy water heaters can be bought online from us here. We also sell weather stations and weather recording equipment.